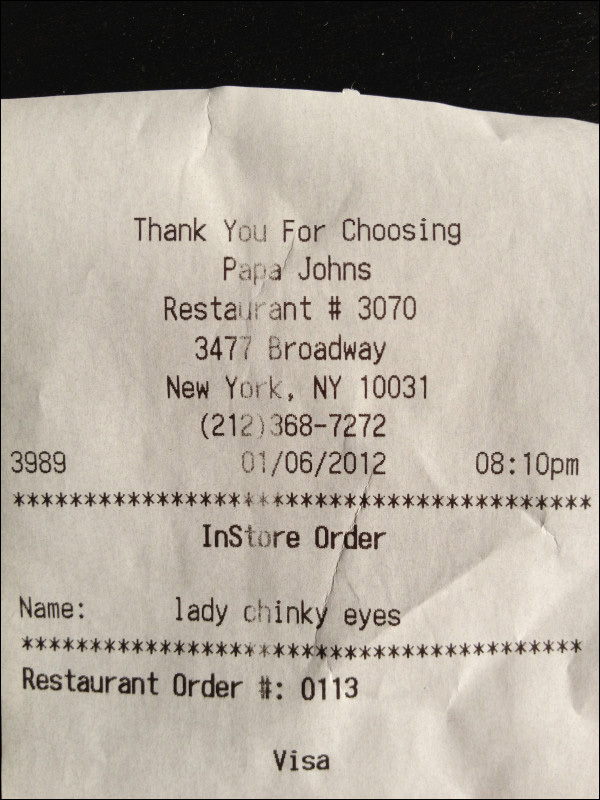 Papa John's and "Lady Chinky Eyes"
Papa John's employee nicknames Asian customer "Lady Chinky Eyes" on receipt. Minhee, a recent customer at the Papa John's Pizza location on 3477 Broadway in New York City, was given this receipt for her transaction on Friday evening. 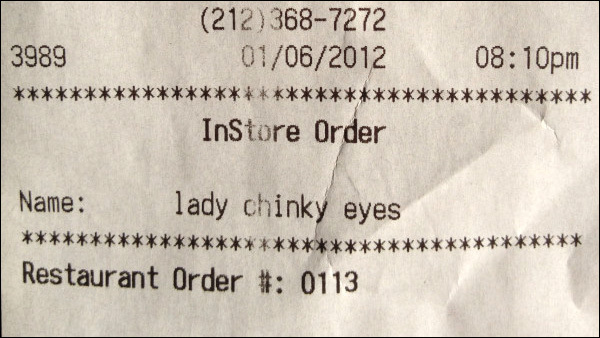 As you can see, an employee took the liberty of giving her the nickname "lady chinky eyes." An employee who, no doubt, will soon be out of a job. Conveniently, the restaurant's contact information is right there on the receipt. 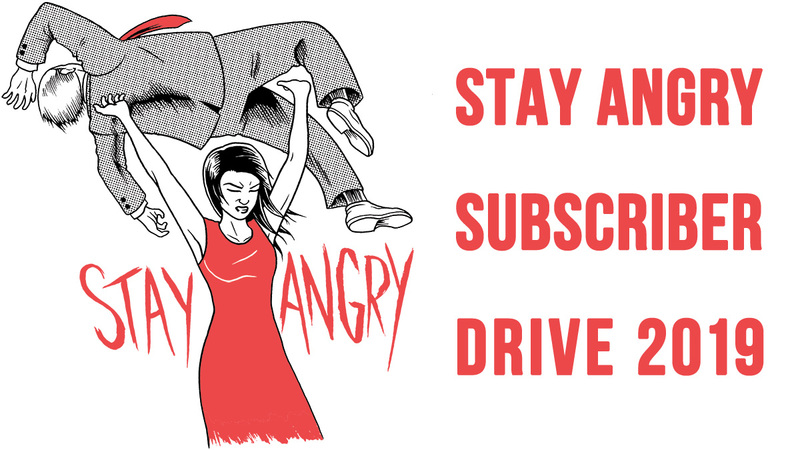 If you've got a moment, free to give them a call (212-368-7272) to discuss topics like pizza, customer service and racial mockery. Between this and the Chick-Fil-A "ching" and "chong" incident, I'm going to have to start examining my fast food receipts more carefully. UPDATE: The Huffington Post and NY Daily News have picked up on this. The Papa John's store owner blames the teenage employee's behavior on "modern culture," whatever that means, and says he plans to have "sensitivity trainings" to avoid situations like this in the future. That's it? Meanwhile, the employee who called a customer a "chink" remains on the payroll? UPDATE: The employee in question has reportedly been terminated: Papa John's apologizes, fires employee for racial slur. We were extremely concerned to learn of the receipt issue in New York. 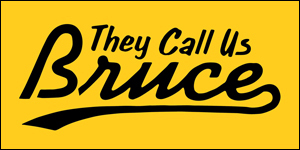 This act goes against our company values, and we've confirmed with the franchisee that this matter was addressed immediately and that the employee is being terminated. We are truly sorry for this customer's experience. This was really the only course of action. However, Minhee tells me she's been in touch with Papa John's senior PR rep about the whole incident, and the manager in question has apparently been suspended for two weeks by the franchisee. It's not much, but that's hopefully two weeks he'll spend thinking about how identifying someone as "Lady Chinky Eyes" is not the same as "the guy in the green shirt."